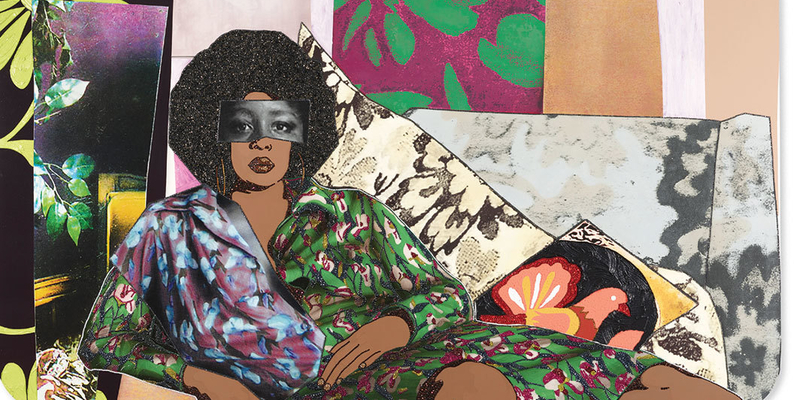 The muse is the métier for Mickalene Thomas, the odalisque her great subject. Thomas’s paintings depicting her late mother, Sandra, or her lovers like Maya and Racquel, spin her relations into dazzling reflections on how we look and touch, who we see, what we desire. Rhinestones and glitter and flock and enamel tessellate into marvelous figures; somehow the facture does not look broken, but like a coming together. Thomas’s is a project of schooling art history in the terms of endearment. Her latest museum exhibition, “I Can’t See You Without Me,” will feature more than thirty works of painting, video, and installation, and is accompanied by a catalogue with contributions by the show’s cocurator, Michael Goodson, as well as Beverly Guy-Sheftall, Nicole Fleetwood, and Antwaun Sargent.